Bactevo’s Totally Integrated Medicines Engine (TIME) assays 100 million samples per hour. 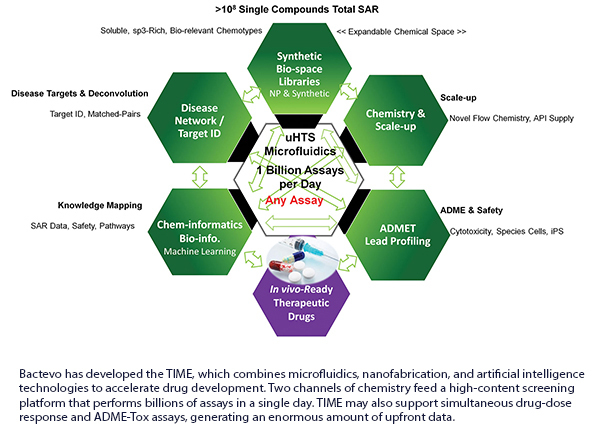 Running multiple assays in parallel, it harnesses next-generation synthetic bio-space libraries, identifies disease networks, and targets and deploys chem- and bioinformatics for knowledge mapping to create and advance in vivo-ready therapeutics while simultaneously performing ADME-Tox (absorption, distribution, metabolism, excretion, and toxicity) lead profiling. In essence, TIME combines library generation, candidate screening, and assay analysis to support a high-throughput approach to drug discovery. TIME can perform a battery of assays in weeks that otherwise would take years to complete, says David Williams, Ph.D., Bactevo’s CEO. In his estimation, TIME could shorten drug-development times by orders of magnitude. The key benefit is the ability to select molecules more rationally. TIME generates a tremendous amount of data on safety and efficacy during the earliest stage of lead selection. As a consequence, explains Dr. Williams, users can be more sure of the molecules they put into the clinic. Bactevo developed TIME by mining the natural products of bacteria to engineer product libraries that reflect the huge diversity of chemical structures that are synthesized by organisms across the bacterial kingdom. Using naturally occurring microbial products as a starting point increases the chances that any resulting drug candidates will have biological relevance and, thus, possess the potential to interact with mammalian systems. The TIME platform was then extended to include the capability to create totally synthetic chemical libraries, with built-in medicinal properties. The synthetic libraries are generated as required and screened with multiple replicates and at different concentrations, allowing both positive and negative data to be used to generate what Bactevo calls “Total Structure Activity Relationships.” That, in turn, provides the foundation for hit selection and chemical optimization. To perform the assays, TIME uses two approaches. The first synthesizes and screens billions of tagless molecules at up to millimolar concentrations within days. The second, complementary to the first, identifies and isolates biologically evolved small molecules. The resulting synthetic chemical library also can be inspired by hits obtained from the engineered bacteria, thus allowing the biologically evolved chemical scaffolds to be further “evolved” to ideal drug candidates. Bactevo is using TIME internally to develop its lead programs in mitochondrial disease. “The mitochondria is a major gatekeeper for other diseases,” Dr. Williams points out. The program is designed to develop therapeutics to improve mitochondrial biogenesis to address defects in mitochondrial function that result in the rare, progressive mitochondrial myopathy, encephalopathy, lactic acidosis, and stroke (MELAS) syndrome and Leber hereditary optic neuropathy (LHON). Diseases of the central nervous system, including Parkinson’s, Alzheimer’s, and amyotrophic lateral sclerosis (ALS), are included in the scope of work. To advance this work, the company also is collaborating with researchers at the Wellcome Trust Centre for Mitochondrial Research, a leading center for basic mitochondrial disease research and patient care. “We’re doing a huge number of things simultaneously,” Dr. Williams says. For example, in addition to its mitochondrial program, Bactevo is in the early stages of research to generate new antibiotic drugs that combat the highly drug-resistant Gram-negative pathogens that cause septicemia, and chest and severe urinary tract infections. The antibiotic program is funded, in part, by the $2.0 (£1.5)-million grant it received when it won Innovate UK’s Innovate Award in January 2017. The company also is expanding the number and types of reagents that can be used with TIME to increase its therapeutic reach and chemical diversity. Bactevo operated in stealth mode until this spring and only recently began talking about TIME. Now, the company is in discussions with select pharmaceutical companies with an eye toward participating in collaborative discovery programs and ultimately presenting its partners with compounds based upon exacting requirements. “We’re evolving a business model that keeps the value of the technology in the company,” insists Dr. Williams. At the same time, Bactevo is augmenting capabilities through collaborations. Later, Dr. Williams says, the company may consider licensing TIME for applications beyond pharmaceuticals. Focus: Bactevo has developed a Totally Integrated Medicines Engine (TIME) that performs 100 million assays per hour. TIME is being used to rapidly advance the speed, efficiency, and quality of drug discovery programs internally and with pharmaceutical partners.